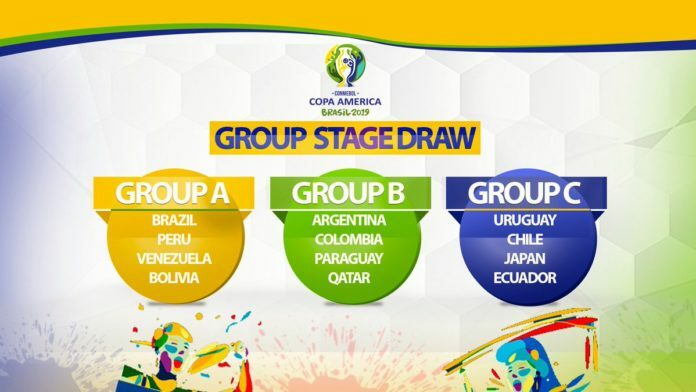 The draws were revealed By the officials, and here we bring to you all the details regarding the Copa America 2019 Groups Draw. Brazil will host the event which features all the CONMEBOL nations, along with guest participants – Japan and Qatar. The hosts are going to open the tournament against team Bolivia before further Group A matches against team Peru and team Venezuela. Argentina, finalists in the previous two events, will meet team Colombia, Paraguay and also Qatar. Winner tittle Holders team Chile will have to face team Uruguay, Ecuador and Japan in Group C.
Host Brazil is in Copa America Group A along with Peru, Venezuela, and Bolivia. It seems that Brazil has found itself in a relatively easy group, and of course it will qualify for the knockout phase of the competition. Brazil has not won the Copa America since 2007 when they defeated Argentina in the final. Peru may be the second country to qualify from this group. Argentina, Colombia, Paraguay, and invited team Qatar make up Group B.
Argentina will be eager to win the trophy as they have been going through a trophy drought even longer than Brazil. They played in the last two Copa America finals, but lost both matches against Chile. It remains to be seen if Leo Messi will return to the Argentine squad for Copa America. Group C consists of Uruguay, Ecuador, invited team Japan, and the two-time reigning champions, Chile. This is surely the group of death, and will stage the toughest group stage ties. If things turn out as they look on paper, Chile and Uruguay should be the two teams which qualify from this group. However, Ecuador cannot be ruled out as well. Stadium Like Arena Corinthians, Sao Paulo will be the host of the Peru vs Brazil match on 22nd of June, while big teams like Argentina and Colombia will fight at the Itaipava Arena Fonte Nova stadium on June 15. Argentina will clash against team Paraguay on June 19 at the Estádio Mineirão, while team Uruguay will compete against Ecuador on 16th of June at the same stadium. Chile will take on Uruguay on June 24 at the Maracana. What Team’s Coaches Have a say on Copa America 2019 Groups matches Schedule? “People do have questioned me about the group draw and some said, it’s easy, others said, be careful. Our responsibility is to perform at the highest level, to play with joy and to be proud of representing Brazil”, said the coach of Brazil, Tite. Argentina’s coach Lionel Scaloni mentioned, “It’s going to be difficult and no matter who we play we have to win”. Hosting Nation Brazil are expected to be a favourable team at the 2019 Copa America groups draw in Rio de Janeiro on Thursday but rivals team Argentina came up with a tough appointment against Colombia. Eight-time tittle winners Brazil, the top seeds in Group A, were given a pool with minnows team Bolivia, Venezuela and Peru. They will definitely kick-off the Copa America 2019 tournament on June 14 against team Bolivia in Sao Paulo stadium.